Former Deputy Governor of the Central Bank of Nigeria, Professor Kingsley Moghalu, on Saturday emerged winner of the Young Progressive Party (YPP) presidential ticket for the 2019 elections during the party’s national convention and presidential primaries, which held in Abuja on Saturday, September 8, 2018. The former United Nations official was officially declared the party’s flagbearer to contest for the seat of the Presidency against the incumbent, President Muhammadu Buhari and other candidates on February 16, 2019, after other aspirants for the party’s nomination stepped down from the race on the eve of the convention. “Right now, our politicians, having fed fat on our resources, are exercising by practising ‘jumpology’, jumping between the APC and the PDP—which only tells us one thing: that neither party nor people matter. In the end, all they care about is what is best for their pockets or their safety from prosecution. 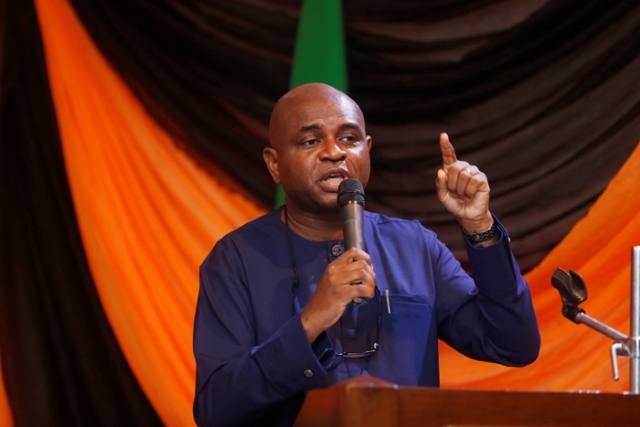 “It is up to us to make the case that their way does not work anymore; that it has only left us in poverty and insecurity; that it has led to many fleeing this country because they feel there is nothing for them and their children here,” Moghalu said. The YPP candidate also emphasised the need for Nigerians to ignore the prevalent thinking that things cannot get better, or wishing for political messiahs who promise to set everything right, stating that there are no magic wands but just him, the members of the Young Progressive Party and every Nigerian working to truly transform Nigeria.